No matter what your budget, if you're designing a new kitchen, you want it to be stylish and functional, so check out these tips and ideas for achieving your dream kitchen for less. Why not build your own kitchen and save on kitchen fitting costs? There are lots of flatpack choices, and help is available to create your own bespoke scheme. Companies like Ikea, Wickes and Wren offer design services and tools, so you can plan everything out and try different looks, styles, finishes and colours to see what suits your space, and there are step-by-step assembly guides. Price estimators can help you gauge costs accurately and decide where to spend and where to save. Take advantage of online how-to guides, tackling jobs like tiling walls and floors and painting kitchen cabinets to get a professional finish. To get a look you love while sticking to your budget, mix and match expensive and more affordable materials. Save pricier buys for areas that are on display and make a feature of them. If you’ve got an island, you could choose a high quality and striking worktop for it and pick a less-expensive worktop for the other units. Combining a fitted or flatpack kitchen with more unusual freestanding pieces can avoid it looking mass-produced. A statement larder will give your kitchen a bespoke feel, without the price tag. You could even repurpose and paint furniture from another room for a characterful touch. If you’ve found a tile you love but it will be too expensive to use for the whole kitchen, limit it to a high-profile area, like a splashback, and complement or contrast with a cheaper tile in the rest of the room. Mix and match closed and open kitchen storage, too. Open shelving is often less expensive and you can make a display of favourite ceramics, cook books or jars. If the layout of your kitchen works and the unit carcasses and plumbing are in good condition, you can revamp your kitchen by simply replacing the doors and drawer fronts. It is a new look at a fraction of the cost and with minimal upheaval. If the doors are still in good condition but feel dated, you could paint your kitchen cabinet doors, or have them wrapped in vinyl for a completely new front. Vinyls come in a variety of finishes, and fitters can re-cover the doors in as little as a day, or it is a job you can do yourself. Choosing a used or ex-display kitchen is a great way to get a designer look at a fraction of the cost. ‘Ex-display kitchens are sold at 50 to 70 per cent less than their retail price, and often include worktops and appliances,’ says Looeeze Grossman, managing director at The Used Kitchen Company. Units can be reconfigured and the worktop can be cut to suit your space exactly. Many companies will be able to recommend a fitter to dismantle, deliver and install the kitchen for an expert finish. 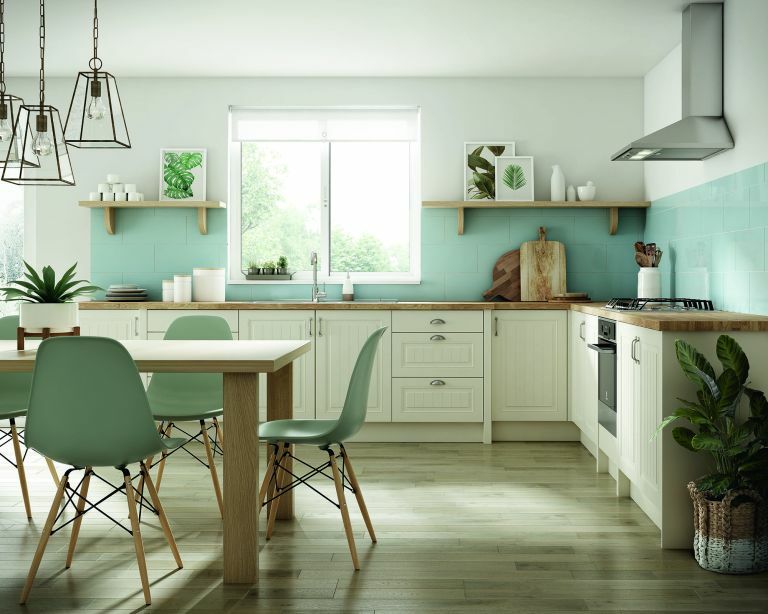 Kitchen stores will often sell off the units they’ve had fitted in their showrooms, and there are companies online that specialise in buying and selling ex-display and second-hand kitchens. You can also look online at general sale sites, such as Gumtree, eBay, Preloved, Schpock or Facebook Marketplace, for people advertising new or nearly new kitchens because they’ve bought a house and have decided to remodel and change the units, or they are extending. In use every day, you want one which will not only look good, but will last. Consider size, shape and water pressure for a perfect fit. A quality fixing – we're talking door handles and knobs and hinges – will be long lasting and allow ease of use. Even if you choose inexpensive cabinets, good fixings can make a huge difference. A natural focal point, they need to be hardwearing. Avoid cheap laminates as they can chip and damage easily. Invest in the best you can afford. Quality laminates can look convincingly like stone and composite. Timber is warm and stylish but requires maintenance. For a statement in an urban-style kitchen, consider stainless steel. Use our guide to kitchen worktop materials to choose the best for you. If you’re changing your fridge-freezer, washing machine or cooker, take advantage of holiday sales and outlet stores for specific brands like Miele, Hotpoint or Whirlpool. It could be worth a trip to save £100s on your white goods, oven and hob. A stainless-steel sink is hard-wearing, easy to clean, resistant to high temperatures, and cost-effective. But be wary of choosing the cheapest steel option as this may scratch and dent easily. Shop around for the best price. Your tiles won’t be exposed to as much wear and tear as your flooring or worktops, so a budget-friendly ceramic can be just as good as pricey porcelain or cement options. Experiment with unusual arrangements; try laying great-value metro tiles in a herringbone pattern and fill with an on-trend coloured grout – simple but effective.